Super tough thermoplastic shelves won't chip, warp, rust, crack or peel! Constructed from injection molded thermoplastic. Shelves are 1-1/2"H. and have a 1/4" safety retaining lip. 3-outlet UL/CSA approved electrical assembly. Three shelf 18" x 24" models hold up to 200 lbs. of evenly distributed weight. Rolls on 4" casters, 2 with locks. 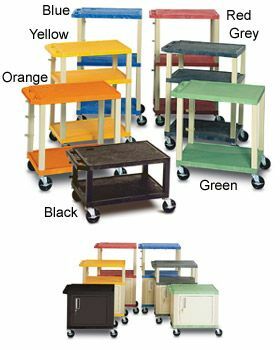 Available in Black (legs/cabinet), with Black, Orange, Red, Yellow, Gray, Green, or Blue shelves - please specify. FOB Shipping Point. A) Open Shelf Cartsinclude 3 shelves and the legs to create a 16", 26", 34" or 42" high cart. B) Cabinet models include 3 shelves, a cabinet, and the legs to create a 26" 34" or 42" high cart. 20 gauge steel cabinets lock & include a set of two keys. Ltr. Size H x W x D Cabinet Wt. (lbs.) Price Ea.